Why Do People Buy Franchises? How Long To Franchise Your Business? How Do You Make Money When You Franchise Your Business? Franchising can be a very effective method of quickly growing your business with minimal investment from you required in new premises, equipment and people. Your franchisees will fund this expansion for you. One of the biggest problems for a business in expanding is finding the right employees to take the business forward. The beauty of franchising is that you get highly committed, capable and motivated individuals who put their own money up to buy a franchise and work in it full time. They are 100% focused on making it work and follow your systems and processes to ensure their success. This also guarantees good quality control and service for customers and clients. The possibilities for franchising are endless too. Over 80 different industries use franchising to get their goods and services to the market place. All franchises charge an upfront franchise fee to their franchisees. This fee usually ranges between £9,995 and £250,000 (sometimes more). This fee usually covers some or all of the business set up costs, training, and opening stock (if applicable). The remainder of the fee goes to the franchisor. Most franchises will charge a monthly management fee to cover the management costs of supporting the franchisees. This fee can range from hundreds of pounds to thousands of pounds depending on the level of support being offered. A % of turnover figure can be charged by the franchisor and would form the main part of ongoing income for the franchisor. This can be charged instead of or as well as the management fee. %'s will usually range from 4% to 25%. Depending on the type of business you have, you will supply the goods that your franchisees require to run their business. 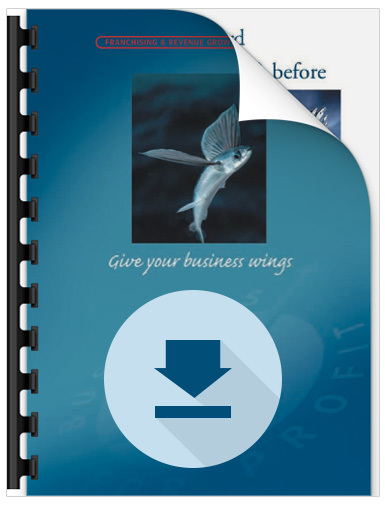 This enables you to grow both your sales and profits. Most businesses have a range of backend products and services that they are able to offer to their customers. A franchise network enables you expand the volume of these products and services that you are able to sell. As your buying power increases through the sales of your franchise network you will be able to get bigger volume discounts on products and services that you purchase. This then increases your profit margin on everything you supply enabling you to make more money. The franchise model for your business will take into account a number of factors such as income opportunities, territory size, lead generation, lead conversion, backend products and services, franchise fees, earning opportunities for franchisees and the actual business model itself. The objective here is to maximise the income opportunity for both you and your franchisee. The key is to spend time getting the franchise model right because the 'franchise offering' is vital to selling the franchise. The biggest factor which will determine how successful your franchise will be is the success of your franchisees. This will help determine how many franchises you sell and the price at which you can sell each franchise. The more successful the franchise is, and the bigger the income opportunity for a franchisee the greater the up front fee you will be able to charge. At Licensing Profits the success of each franchisee is paramount. This will play a big part in determining the franchise model for your business. We firmly believe in maximising the income potential for each franchisee and giving them a territory that will enable them to grow and build a business. At Licensing Profits we have a proven model for selling franchises. Our lead generation and conversion strategies are very effective and we have a large database of people who are interested in buying franchises. We also have a dedicated website and clear marketing strategy for attracting franchisees. Unlike many franchise advisors we take care of almost all the sales and marketing, and the recruitment of franchisees. We do all the qualification so that you only have to meet a prospective franchisee when they are most of the way through the recruitment process. The size of franchise territory will help determine the potential number of franchises that you can sell. You have to balance this against making sure the franchisees have a large enough area to be able to build and grow a successful business. If you sold a franchise by Yellow Page area the number of UK franchises you could sell would be between 70 and 100 depending on specific characteristics. If you sold territories by post code or parts of post code then the figure could run into several hundred or even thousands. If you had 80 franchisees who paid a £20k Franchise Fee this would generate you £1.6m in upfront income before expenses. If each franchisee then generated you an additional £25k per annum in backend profit this would generate you additional profits of £2m per annum for you. You can see from the above figures that franchising has the potential to significantly increase your revenues and profits. This would impact the capital value of your business too, effectively making it worth considerably more than its current value. “I franchised my business with Mark and it was the best business decision I made. In only one year I moved from being a sole trader to a franchisor with eight franchisees (now got over 40). I am very proud of what we have achieved and it wouldn’t have been possible without Mark. Initially I was looking for someone to help draw up the legal contracts at a reasonable price. Mark provided that for sure, but so much more! What I didn’t expect was just how hands on he would be.